How’s Your Church Making Disciples? You are here: Home / Blog / Disciplemaking / How’s Your Church Making Disciples? 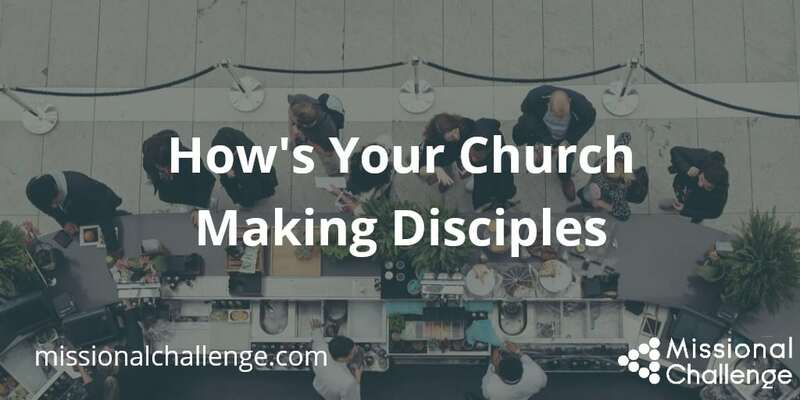 How are you and those in your church involved in making disciples who make disciples!? 1. We are discipling our missional community leaders and training them to walk through life with the people in our missional communities. 3. One-on-one mentoring using the Purple Book Discipleship guide and Life groups. 4. Organic personal times with folks in small groups, one on ones, preaching the word, shepherding care, living mission in community, serving those less fortunate. 5. We meet weekly for 3-6 months in Discipleship Groups. Each DG has one discipler and 1-3 disciples. They cover our 5 core values: the gospel, communion with Christ, community with one another, commission to the world, and multiplication. Under each core value we cover several subtopics. Each disciple is required to do daily devotions, reach out to their oikos, and complete weekly assignemnts such as readings, memory verses, and real-life assignments. At the conclusion of the DG, which is determined by the discipler, each disciple is evaluated and if he/she is ready, they are helped to recruit and lead their own DG, preferably with the people they have been reaching out to. How is your church or missional community actually making disciples who make disciples? Consider how you will join Christ in His mission of making disciples who make disciples!